There's been a craft beer revolution going on in the UK over the last decade, with over 2,000 breweries plying their trade, and the upstart likes of Punk and Beavertown making serious money through rapid expansion and buyouts from much bigger international breweries. Most of these brands, naturally, have a very British flavour to the way they work and their, er, actual flavour. But one south London brewery is putting a distinctly German spin on the microbrewery business. German Kraft produces extremely authentic Bavarian lager using London tap water, some fantastic tech and a medium-sized brewery crammed into a comically small space. Now is that a German-looking microbrewery or what? German Kraft opened last year in Mercato Metropolitano in Elephant and Castle, south London. Some of MM's stalls change what they sell at a quite remarkable rate, as the market makes some rather harsh judgements on what is or isn't on-trend in the foodie world, and there seems to be a new feature appearing almost every week. So it was no surprise when a bar called German Kraft appeared in a small space in the middle of the complex. It was a bit more of a surprise when they announced they were going to build a microbrewery behind the bar so they could stop importing their 'Kraft' beer from Germany and start brewing it on the premises. The volume of space involved didn't seem big enough to fit such a venture, but we guess that's why they call them microbreweries. 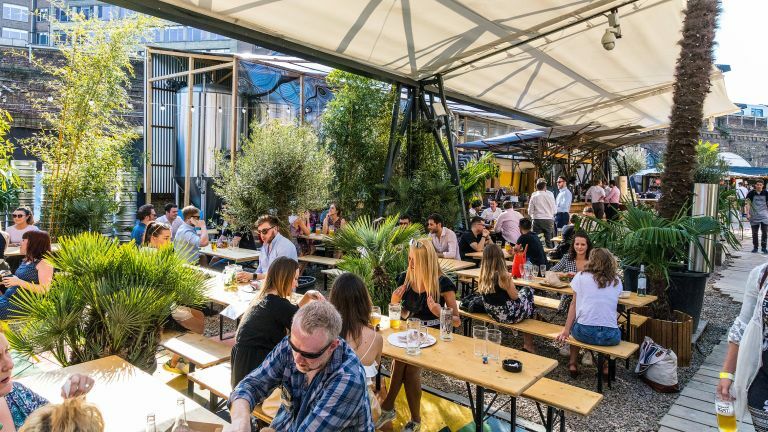 Sure enough, there is now a brewery towering over the bar, which has expanded to include a cooling room, with pipes running out to additional tanks in Mercato Metropolitano's back yard. Germans are renowned for their efficiency, and that certainly goes for the use of space here. The walkway at the front of the brewery even doubles as a performance space for bands and DJs, including German Kraft's own 'Braumeister', Tobias Medla. The name Kraft and its slogan – 'Meisters of Purity' – are also about as German as one can get. And why do they spell 'Kraft' with a capital K? Because it is 'representing professionalism and strength in execution… and German-ness.' But of course! The brainchild of Florian Bollen, and run by a small team that includes Florian's son Felix, as well as Michele Tieghi, Anton Borkmann, Andrea Ferrario and Silvia Bollen, German Kraft uses some seriously next-level tech to recreate Bavarian lager in the less-than-Teutonic surrounds of an Italian food market in darkest south London. The rather complicated diagram above gives you the general idea, but the key tech here is the memsys membrane distilling process. There's a very lengthy explanation of this that we could give you, but to boil it down (ho ho!) to the basics, it involves distilling normal tap water so that all minerals, additives and, essentially, everything are removed. The distilled water then has the exact same minerals added to it that you'd find if you were brewing in Munich. This isn't just an exercise in nit-picking authenticity, it also means the water is always the same so that the beer, at least in theory, will also always be the same. The memsys membrane technology also has potential uses in projects that are even more important than beer making – such as the large-scale, energy-efficient desalination of drinking water in places that desperately need it. The only place we've seen this sort of thing before is in coffee making, where chains large and small need the water used to be the same whether the branch is in Aberdeen or London. The cleverness doesn't end there, however. Excess heat and water are pumped away to be used to create hot and cold water that, depending on its state, is used to clean the rest of Mercado Metropolitano, or even to be bottled and sold as mineral water. As you know, a lot of heat is produced in the fermentation process. And so, completing the virtuous circle, this heat is pumped away to be used to… distill the water that is used to make the beer. The actual brewing part of the tech is provided by Zip, a German-born, Hungary-based brewing technology company. None of this would matter if the beer produced was turgid muck but it is quite the opposite. In fact, as it's being pumped from about three feet away from the bar it is, as you'd imagine, decidedly lively. That's why a cooling room is required both here and in the small number of London restaurants that sell German Kraft. Bottling it is also rather tricky, as the bottles would naturally tend to explode, which some people find a bit off-putting. So what we're saying is, this beer is fresh. Florian Bollen has big plans for German Kraft and the memsys membrane tech that underpins it but for now we recommend you sample it for yourself in the form of a ginormous foaming mug of Heidi Blonde. It's German Kraft's signature brew and, needless to say, you can have it with a wurst, if you like.